A Taiwanese minister has caused widespread debate on hygiene by suggesting that men should sit down while urinating instead of standing up. Stephen Shen, Environmental Protection Administration (EPA) minister, said that sitting on the toilet like women do creates a cleaner environment. This has generated a lot of online debate, says the BBC's Cindy Sui. Officials are to ask local governments this week to put up notices in public places advising men to sit. While many women in social media websites favour the suggestion, a lot of men say it would be hard to stop doing what they are used to, our correspondent in Taipei adds. But EPA officials insist that it can be done. "We want to learn from Japan and Sweden," said Yuan Shaw-jing, EPA director general of environmental santitation and toxic substance maintenance. "In Japan, we heard 30% of the men sit," he added. Inspectors regularly grade Taiwan's estimated 100,000 public toilets, with most of receiving high marks. But EPA officials say there is room for improvement, as some toilets are still smelly because of urine spatter. While the agency said that it cannot force men to change their habits, it will ask local governments this week to put notices in public toilets with the suggestion. 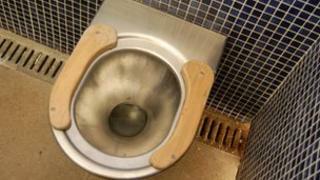 As for Mr Shen, the EPA confirmed that he himself practices what he suggests - at home and while using public toilets.